Total solar eclipse over North Carolina. North Carolina eclipse. Great American Eclipse. 2017 solar eclipse. Solar eclipse 2017. 2017 eclipse. The Great Smokey Mountains National Park is one of three national parks visited by the total solar eclipse. The Great American Eclipse slides across the southwest corner of North Carolina at the Great Smokey Mountains National Park. The highest point in these mountains is Clingman's Dome with an expansive vista. If the crowds are manageable, a high unobstructed spot in these mountains may be an appealing venue to watch the eclipse. The reason is that from a high vantage, you'll also have the chance to see the surrounding landscape darken and brighten again as totality races across. But be sure to have a clear vantage unobstructed by trees. Andrews, North Carolina is on the centerline of the path of totality and will see 2 minutes and 39 seconds. Franklin will enjoy 2 minutes and 30 seconds. 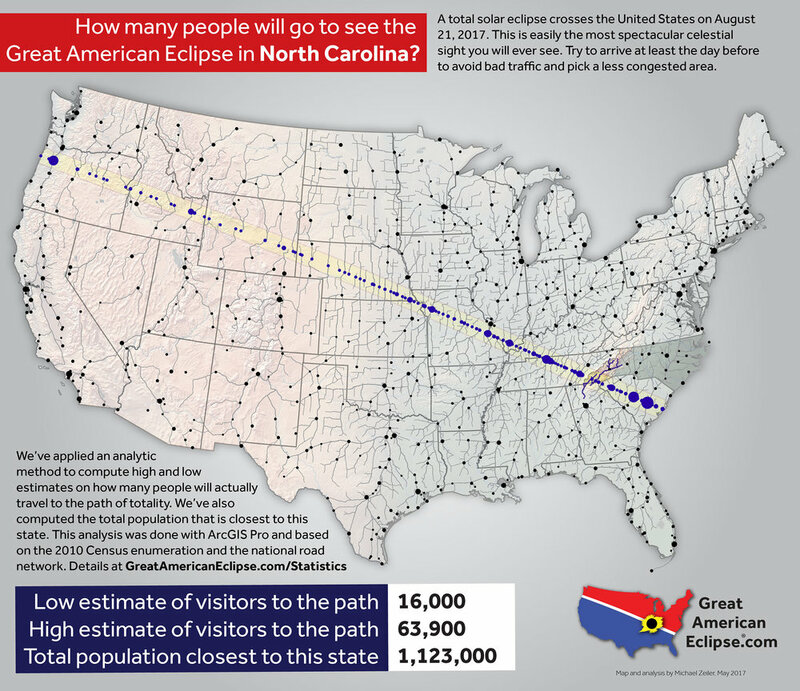 Since the portion of North Carolina within totality is small, the Moon's shadow will pass quickly. The total solar eclipse first touches North Carolina at 2:33 p.m. EDT and exits at 2:49 p.m. EDT.